An early bounce in Europe has faded and U.S. futures are little changed. Another ho-hum day to come? 1. German stocks rebound: The benchmark DAX index briefly broke back above 10,000 points, a level last seen in July, on growing expectations that the European Central Bank will buy a broader range of assets to get the eurozone economy moving again. "Additional asset purchases by the European Central Bank in the near future are much more likely," said Christian Schulz at Berenberg. "The question is no longer if, but when and what?" The ECB is expected to cut its forecasts for growth and inflation on Thursday. But economists are split over whether it will act this week to bolster its stimulus efforts, or wait until early next year. The DAX later slipped lower, but is still up about 18% since mid-October. Other European indexes were mixed. 2. Futures edge higher: U.S. stock futures were slightly firmer after markets ended down Monday. 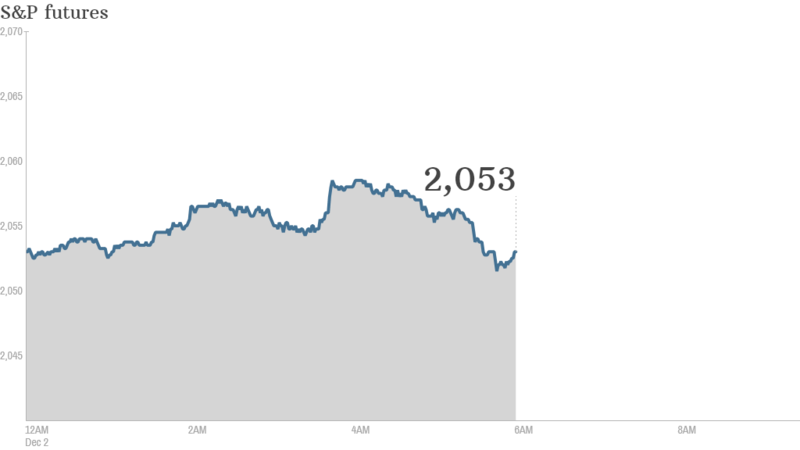 The Dow lost nearly 52 points, the S&P 500 slipped 0.7%, and the Nasdaq closed 1.3% lower. The U.S. Census Bureau will report construction spending at 10 a.m. ET. Restaurant chain Bob Evans (BOBE) will report quarterly earnings after the closing bell. 3. Oil resumes slide: After a rebound Monday, world oil prices are falling again in early trade. U.S. crude futures are down 1%. 4. India holds fire: The Reserve Bank of India kept interest rates unchanged, surprising some observers who were expecting a rate cut after growth slowed in the most recent quarter. India's benchmark Sensex index slipped lower, against a trend of firmer markets elsewhere in Asia. 5. Abe campaigns: Japanese Prime Minister Shinzo Abe has kicked off campaigning in parliamentary elections he called two years early. The election gives voters the chance to pass judgment on Abenomics -- Abe's strategy to combine higher government spending, huge central bank stimulus and reforms to resuscitate the world's third biggest economy.